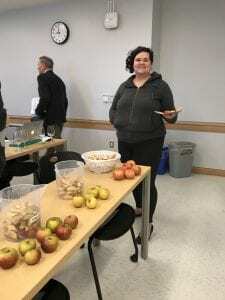 This course covers the scientific basis of cider production from orchard to bottle and provides an overview of the history and culture of cider. We will also review the current market trends and the economics of growing hard cider apples and producing cider. The suita bility of producing cider will be contrasted with wine production in New York State. 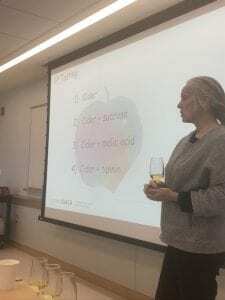 Each class will include tastings so that students receive a robust overview of typical cider flavors, an introduction to different cider styles, and gain an ability to determine the cause of off-flavors and other faults. This is a seven-week course. Students will be immersed in cider production and analysis through hands-on activities in the teaching winery and by visiting commercial cideries. Readings and discussions support the hands-on learning focus in this laboratory course. Significant winery time between weekly class sessions is required. The science of tree-fruit production with an emphasis on the agroecology and physiology of regionally important species. Topics include: site selection; orchard design; clonal rootstock and variety selection; nursery production and grafting, tree pruning and training; flowering and pollination; crop load management; water, nutrient, and soil management; fruit ripening, maturity, and storage; marketing and profitability; integrated pest management; orchard mechanization; and sustainable and organic production practices. Orchard field trips and lab sessions will provide practical, hands-on experience. Designed for those interested in both commercial and hobby tree-fruit production, pomology extension and research careers, and advanced students interested in synthesizing and applying knowledge from a broad range of life sciences within the context of perennial crop agroecosystems.